State Sen. Dan Blue, (D-Wake), discusses Senate Bill 247 during a press conference on Wednesday. 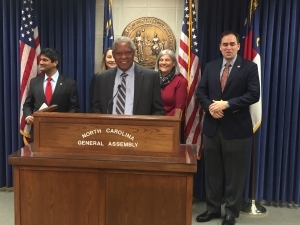 After 25 years in the charter school business, North Carolina needs a “recess” from granting new charters while a proposed legislative committee studies their impact on traditional public schools, Senate Democratic leader Dan Blue said on Wednesday. Describing himself as a strong supporter of charter schools, Blue said lawmakers must begin to hold charters accountable for how they spend public dollars. Blue noted that state spending on charters grew from $16.5 million in 1997 to more than $580 million last year. Blue’s remarks came during a news conference Wednesday to discuss Senate Bill 247, which would prohibit the State Board of Education from granting final approval of any charter applications once the bill is approved. SB 247 would also establish a 10-member Joint Legislative Study Committee to study the impact of charter schools on traditional public schools and student academic performance. The SBE would presumably resume granting charters after the new committee issued its report and recommendations. Current charters in the pipeline would not be affected. The bill’s primary sponsors are Blue and Senators Jay J. Chaudhuri (D-Wake) and Mujtaba Mohammed, (D-Mecklenburg). Blue said state dollars available for education spending are at a premium due to Republican tax cuts that cost North Carolina $3.5 billion annually. Rhonda Dillingham, executive director of the N.C. Association for Public Charter Schools, said SB 247 makes several false assumptions. She said charters already provide a “full accounting” of the state dollars they receive. Dillingham said charter’s test scores are also readily available like those of traditional public schools. She said SB 247 would deny families educational opportunities. Christine Kushner, a member of the Wake County Board of Education, said her district passed through nearly $36 million year to area charters last year. When families enroll their children in charter schools, educational dollars follow them. They are passed to charters through local school districts. Natalie Beyer, a member of the Durham Public Schools Board of Education, said Durham County had the foresight to merge its predominately white county schools and majority black city schools in the 1990s. “Sadly, North Carolina’s charter school legislation is recreating a new separate and unequal system in our community,” Beyer said. Since the cap on charters was removed in 2011, the number of charters in Durham has grown to 14, including two virtual charter schools. Beyer said the increase in charters has reduced the level of services Durham Public Schools can provide students. “As a taxpayer, I’m concerned about the rapid expansion of charter schools across our state,” Beyer said. The number of charters across North Carolina exploded to 184 after lawmakers lifted the cap. And over a 10 year span, enrollment increased by 200 percent. This year, the number of students enrolled in charters climbed to 109,389, which is about 7.3 percent of the state’s 1.5 million students. Of the $8.93 billion in state funding for public education, 6.5 percent — $580 million — was allotted to charter schools. School districts in rural parts of the state have been particularly hard hit by the growth in charters. In Granville County, for example, the school district was forced to close and consolidate schools after losing hundreds of students to area charter schools. The history of charter schools in North Carolina, including the original intention behind their authorization. The impact of charter schools on local school administrative units and the benefits and harms of expanding charter schools. Innovative ideas for improving local school administrative units. Proposed transparency and accountability standards for charter schools, including, but not limited to, public audit procedures, compliance with open meetings laws, accessibility to meetings and minutes from the meetings of the boards of directors of charter schools. Metrics used to measure academic success of students in charter schools and processes used to admit and reject students’ applications to charter schools. Charter school student and teacher attrition rates and the impact of charter school student and teacher attrition on local school administrative units. The extent to which charter schools are able to provide a sound basic education to their students and inhibit the ability of local school administrative units to provide a sound basic education to their students. The State’s system of funding charter schools and a complete financial analysis of how State and local funds allocated to charter schools impact funds made available to local school administrative units. The impact of the termination of a charter school’s charter on students. The extent to which charter schools serve children with disabilities and students with other special needs. The academic performance of all charter school students, as compared to students in local school administrative units, including children with disabilities. The extent to which charter schools have an impact on segregation and racial isolation in local school administrative units and charter schools. The extent to which charter schools employ best practices in teaching and administration. Suspension and expulsion rates in charter schools as compared to local school administrative units.